Acquire a year's supply of food. 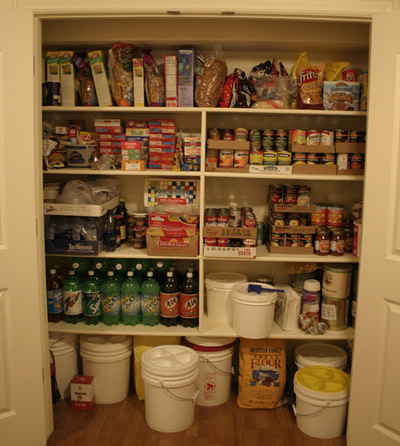 Church members can begin their home storage by storing the basic foods that would be required to keep them alive if they did not have anything else to eat. When members have stored enough of these essentials to meet the needs of their family for one year, they may decide to add other items that they are accustomed to using day to day. All food contains bacteria and mold spores, and most food contains insect eggs. Given the right environment, these microorganisms will start to grow and destroy the food. The main conditions that can cause insects and microorganisms to grow are moisture and heat. Protect food storage from heat. Store all products away from heat and sunlight. Food stores best at 70 degrees or cooler. The cooler you keep your food, the longer it will keep. Heat is a major cause of deterioration in food quality. Store all products away from heat ducts, clothes dryers, sunlight, chimneys and other sources of heat. Protect food from moisture. Store products on shelves or raised platforms (such as 2x4 inch boards), rather than directly in contact with concrete floors or walls, to avoid moisture damage. If products are not properly packaged, they can absorb moisture out of the air. When the moisture reaches a level of 12% to 18%, product breakdown will accelerate. Make sure to store food in a dry place. We just opened a 5 gallon bucket that was filled with packages of brown sugar and topped off with a gamma lid. We filled it up 2 and a half years ago. I thought the brown sugar may be all hard and clumpy - it was perfect, just like when we bought it from the store. How long will they last? If properly stored. This is an example of a 3 months supply for one adult. This 8 foot pantry can hold around 6 months of storage for 2 adults. FoodStorageNow.com has a list of items such as toilet paper, feminine hygiene, medicines, toothpaste, soaps, diapers, batteries, fuels, as well as foods that you use on a day to day basis. One-month kits are available for purchase through the church storehouse (cannery). 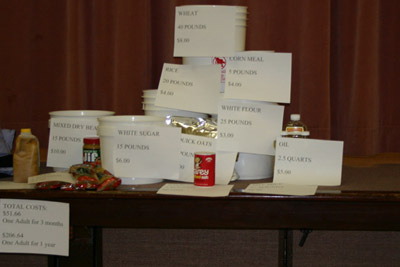 Kits are pre-made with supplies for 1 adult and include cans or foil bags of basic items. You'll receive: 3 wheat, 1 flour, 2 rice, 1 quick oats, 1 macaroni, 1 pinto bean, 1 sugar, and 1 milk. They also include 1 container of oil, 2 containers of salt, and 8 lids for the cans. The cost is around $30 for cans or $27 for foil pouches. Grain Maker Hand Mill - I think this is the best hand grinder you can buy. You can also drive it with a motor, bike or anything else that can turn a belt. Back To The Basics Hand Mill - I would only use this if it was my only option. It is better than nothing and much more affordable than the GrainMaker, but it doesn't even come close to the GrainMaker. Provident Living - A link off of lds.org with many valuable resources, including a food storage calculator. San Francisco Herb Co. Wholesale prices on the highest quality culinary herbs and spices. For shelf life and preparedness sites go to Walton Feed, Prudent Food Storage,or About. Sites found with directions for cooking dry eggs Pioneer Thinking and The Ingredient Store. Some items we've reviewd are available here. Prices always change, so shop around. At the least this will get you to a store with more info on the products. Fourteen gallons per person is a suggested minimum reserve. 55 gallon drums work well for water storage. If you plan on storing more than a few drums, you might want to consider a tank instead. Tanks like the ones Rotational Molding of Utah sells can save you a lot of space. In a 4' x 4' area you can store 500 gallons. Store some water in containers that you can carry and load in your car in case you have to leave the area. When we moved we had to put some of our food in a storage unit. You really should try to avoid it, but that isn't always an option. If you are moving to another area, check the historical weather for the months that your food will be in storage. If it is going to freeze, you'll wind up with a mess, if it gets too hot some food may go bad or have a very short shelf life. Some people try to eat as much of their storage as they can before they move, that is one way to rotate it! Page generated in: 0.0022 sec.